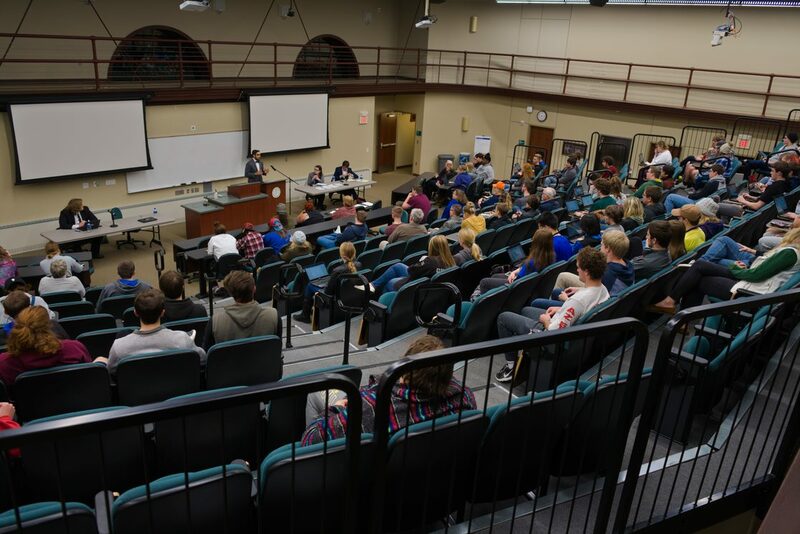 On the evening of Nov 1, two DSU students took on two British debaters arguing whether the American Dream is dead. By audience vote, the debate was a tie. First-year students Marcus Metivier and Khalid Hussein held that the American Dream is alive, while the British team, Méabh Flanagan from Ireland and Owen Mooney from Scotland, took the stance that the American Dream has died. The British team began the debate by stating the ideology of the American Dream: everyone has the opportunity of success if they work hard. He then noted that many in the U.S. are denied access to rights that would make success possible due to poor educational opportunities, lack of healthcare, political oppression, and racial prejudice. The structure of capitalism, Mooney asserted, makes it so that your parents have more of an effect on your success than any amount of hard work you do. He concluded that the American Dream is indeed dead and the corpse of it is in the way of a system where effort reaps appropriate benefits. The DSU team started by agreeing that the American system is imperfect, but also stating that the country has already achieved monumental success in its young age. Hussein recalled that the American Dream was way out of reach when it was first introduced, but we are getting closer to it. He expressed that the American Dream is alive for many: those that seek refuge in this country, international students pursuing more success in life by coming here and everyday people that pursue their American Dream by attending college. If the American Dream is alive to these individuals, he noted, it is alive to everyone. He concluded that the goal of the Dream is that we are fighting for it be attainable for all. 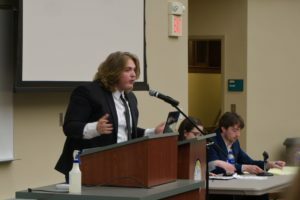 Both teams reiterated their initial points throughout the debate, holding their ground while also responding to the challenges their opponents raised. The audience was split over which team defended their stance better, as indicated by the 37-37 vote. Though the DSU team did not win the debate, the event was a success for the school. President of DSU, Dr. Griffiths, thought it was wonderful to have a civil debate like this on campus. She saw it as an “exploration of ideas and different perspectives” and hopes to see DSU host more events like it in the future.